Mbuzi Mbaya means "bad goat" in Swahili, which obviously doesn't refer to the quality of this young buck. When he was breeding does in the Fall of 1998 he figured out how to open the gate at my friend's house, and let himself into their backyard. Once there he would proceed to eat their flowers. "Bad goat" was the only name they called him that I could translate into Swahili, since the lists of Swahili words and terms I found on the internet didn't contain any profanities. Luckily they restrained their urges to turn him into very expensive barbecue, and we found a way to keep him out of their yard. He went on to produce a very nice group of kids from those does. 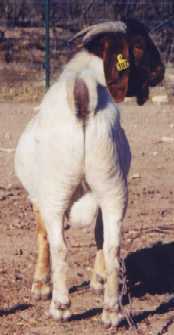 Like his brother Hakuna Matata, Mbuzi Mbaya is a quality goat. He has great conformation, a fast growth rate, heavy muscle, looks impressive, and most importantly for a herd sire, passes those traits to his offspring. I can't decide whose kids are nicer, his or Hakuna Matata's. 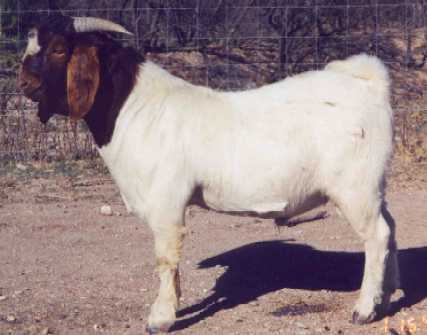 His pedigree is full of famous show winning goats that helped build and improve the Boer Goat breed in South Africa and the USA. 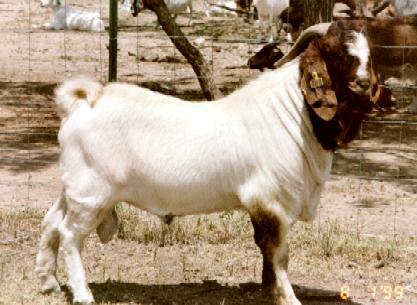 Goats like Nico Botha's 007, and Downen Livestock's Ubora. His genetics are 100% South African. available where he was breeding does we were unable to pen him during the day. He also bred 2 groups of does, whereas Hakuna Matata only bred one group. As a result Mbuzi Mbaya didn't get the quantity or quality of feed Hakuna Matata did for 12 weeks. On his first birthday we weighed him, and he tipped the scales at 189 pounds (40 pounds lighter than his brother). That works out to an average daily weight gain of .49 pounds per day everyday of the first year of his life, but if you adjust for the 12 weeks of growth he lost that figure could have been as high as .64 pounds per day. After using Mbuzi Mbaya in our breeding program for 3 years we sold him on December 29, 2000. We have retained many of this buck's female offspring, and his genetics will positively influence our herd for years to come. Below is a photo taken on August 1, 1999 when he was 16 months old.